I struggled very long with the thought of using snail mucin on my face. I heard about its fantastic healing properties, but couldn’t really get past the eek factor. It wasn’t until I had read umpteen reviews about how amazing this product is, and a time when my face broke out so bad that I was in full-blown panic mode, that I finally got around to trying this miracle ingredient. With a 70% concentration of snail slime extract, this soft cream works hard to brighten, revitalize, and renew the look and feel of skin. 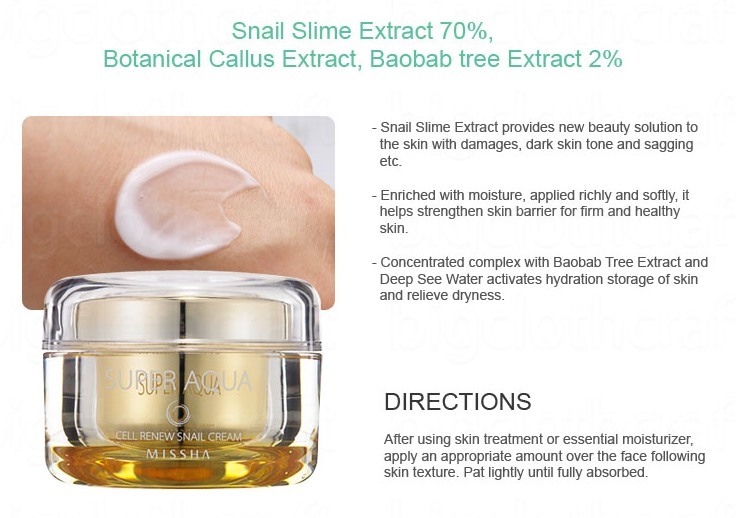 Look at the top ingredient – snail secretion filtrate!! MISSHA is definitely not stingy with the amount of snail mucin they’ve put into this product. Packaging: This packaging is. So. GORGEOUS. Imagine my excitement when I saw the pearlescent lid – totally looks like a pearl nestled in the box! I do think that the rest of the packaging (plastic and all) is quite typical of MISSHA’s skincare products, based on previous experience. Texture: Please don’t imagine that because this cream uses snail mucin, it will have some gooey, sticky texture. This is actually quite watery/aqueous – I can easily apply a thin layer evenly, and it will get absorbed by my skin very well without leaving behind any sticky and oily residue. It doesn’t feel thick at all on my skin and neither does it clog up my huge pores, so I think this is definitely great for people with oily skin. Effectiveness: I haven’t had much trouble with signs of ageing, but I have to say that this snail mucin is miraculous. I saw results IMMEDIATELY after the night I used this, and everyone commented on how my face suddenly glowed. It was honestly that great. As I mentioned earlier, I started using this because I had a terrible breakout – my face had all these red patches, acne scars, and clogged pores for no good reason (that I can think of). By the next day, half of all my skin problems were gone and my skin looked almost back to normal. After using it for about a week, my skin actually looked even better than it ever had before! It was almost clear of acne, and people around me remarked that it looked more smooth and fair. It’s been a long time since I had a good, long period of almost-clear skin, and it honestly just felt like a miracle. UPDATE: I tested out how good the product is in terms of hydration and sebum control, and I have to say that I am SO impressed. Hydration level went up by 22.7%, and oil level decreased by 6%! Note that I did not conduct the ‘after’ test immediately, but waited a while for the product to settle in. Not every ‘holy grail’ product you find online is really worthy of that holy grail status, but this product is definitely worth any accolade you can give it. It’s been a long time since I dreamt of clear skin, much less that dewy, bouncy one that every Korean seems to sport. However, I’m starting to think that it’s not as far-fetched a dream as I once thought, thanks to this amazing snail cream from MISSHA. This is honestly my favourite cream of all time, hands-down. I am absolutely blown away by how great this is, and I’ve been going around telling people that snail mucin is seriously that thing we’ve all been lacking in our skincare routine. I know the price is not exactly budget-friendly, but this is one of the rare few products that I’m telling you that you have to get despite the price. This is that product you can buy to save you all the money from acne patches, moisturizers, anti-ageing cream, highlighters, facials etc. This is seriously value for money when you find out how good this product is in keeping your face looking the most radiant it has ever been. I promise you that this will be one of the best skincare products you can ever invest in, and once you start using snail mucin in this MISSHA cream, you’ll be more actively looking for this ingredient in other products than you ever imagined. Missha is a great brand. Definitely going to try this one out. Followed ur blog too. I’ll tune in for more awesome posts.